The city of Ketchum on Thursday announced the hiring of Micah Austin, currently community development director for the city of Hailey, as Ketchum’s departmental director of planning and building. Austin will fill the vacancy left by Joyce Allgaier, who left the city earlier this month to take a job with a consulting firm in Breckenridge, Colo. Austin is scheduled to start work on Jan. 5. In the interim, Linda Haavik will continue filling in as planning director. Haavik was appointed Monday, Oct. 27. She owns a private consulting business to help private landowners with land-use and development applications. Haavik was Ketchum’s Planning Department director between 1978 and 1992 and Blaine County’s building and Planning Department director from 1992 to 2007. In terms of filling the position, City Administrator Suzanne Frick said Ketchum “had a good idea of the outside candidate pool” as well as the local choices, thanks to the recent hires of city administrator and city planner. As community development director for Hailey, Austin has been involved in negotiations regarding the a major annexation proposal in Bellevue. He worked on a list of 12 recommendations to Bellevue with Hailey Mayor Fritz Haemmerle. Hailey City Administrator Heather Dawson said the city is sad to see him go, but is excited for his future. “We wish him well,” she said. Dawson said the city of Hailey has not yet made inroads into finding a new community development director, as Austin only announced his resignation Wednesday, Oct. 29. Austin has been with the city of Hailey since 2012. 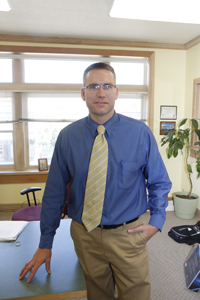 Prior to that, he served as community development director in Jerome for more than three years. His background includes stints as a park ranger, mayor’s assistant and city planner in Indiana and Kentucky. Austin speaks Russian, thanks to a Mormon mission to Russia. Austin has a four-year degree from Utah State University and a master’s degree in public administration from Indiana University-Bloomington. A news release states that he completed a capstone project on the future of electricity during graduate school. Frick said Austin’s annual salary will be $99,187 plus benefits.